This beautiful chalet is a short distance from the centre​ of the very popular Leogang, with a wonderful view of the superb mountains. 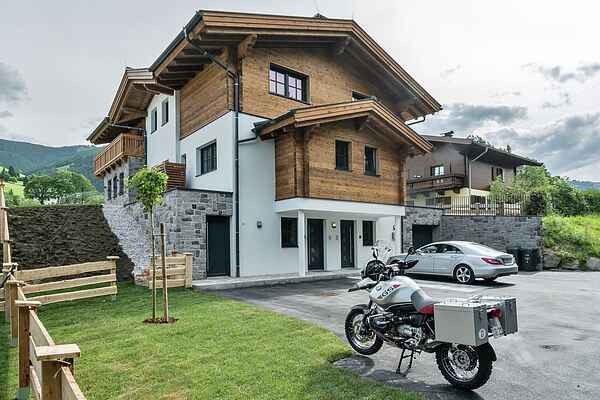 This chalet is semi-detached, so you'll have the entire left half of the house to yourselves. Because of its large floor area, split over three floors, this chalet is ideal for friends or families travelling together. The high-quality interior and warm atmosphere ensure that you'll immediately feel at home. On the ground floor, you'll find the living room with open kitchen, which offers direct access to the large terrace and the garden. The main bedroom with bathroom is also here. On the first floor, there are two very spacious bedrooms, each with an en-suite bathroom. As the house was built on a slope, an attractive basement, which is mostly above ground level, was incorporated into the design. This floor hosts a spacious bedroom, a utility room with a dryer and a washing machine and your private wellness area with sauna, which is the perfect place to relax after a day out in the snow, a long walk or a mountain biking tour. In short, a magnificent chalet, totally deserving its four star rating. Leogang is one of the most popular destinations in Austria throughout all seasons, due to the large variety of activities on offer. From spring to autumn, these include mountain biking, golf, hiking, glacier skiiing, paragliding, horseback riding and of course, those looking for some peace and quiet can also find some nice natural areas here. For winter, no further explanation is needed. The largest ski resort in Austria, Saalbach-Hinterglemm-Leogang-Fieberbrunn, is right at your feet.